Is Lip Gloss a Gateway Drug? No, of course it isn’t, don’t be a schmuck. 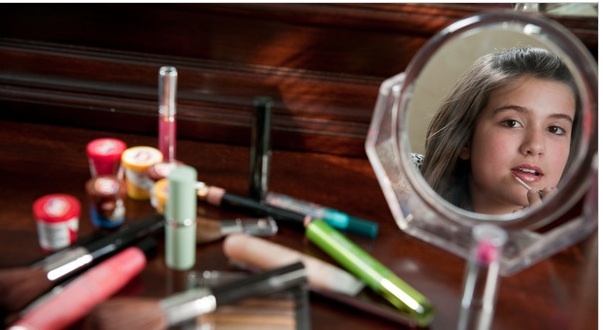 Still, a new study shows that tween girls are using cosmetics at a higher rate than ever before. And it all starts with lip gloss. Who’s to blame? Take your pick: the beauty industry, the media, candy stores that sell “lip savers” to children. But don’t overlook the parents–the study shows that moms are increasingly the ones providing the tweens with their first fix. From the Thursday Styles Section: Graduating From Lip Smackers. And as long as we’re on the subject: $1 to the first person who can explain to me why we had to swap “pre-teen” for “tween.” Did someone complain? Tweens are in a very specific age range (10-12) pre-teens tended to confuse the issue with their single-digit ages being thrown in there. Makes it easier to market things like lip gloss. I think you know where to send my dollar.